I have to admit that my heart broke a little when Long Island, NY-based progressive metal band Night Verses announced the departure of vocalist Douglas Robinson last year, and planned to continue as an instrumental trio. I thought the former The Sleeping-frontman’s emotive vocals were a great fit to the bands technical prowess, and at first wasn’t entirely sure if their music would work without him. 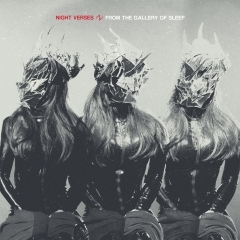 That was a feeling that stuck with me even as they began to release single tracks of this new record, “From the Gallery of Sleep”; I felt like something was missing all of a sudden, even though I could tell the tracks were great. It took me a while to come to terms with it, but finally, all of a sudden, it just clicked. The band seems to have unlocked their full potential with this release, as the virtuoso performances of the three instrumental musicians take center stage. The result is arguably one of the best albums of the year and an album, which I’ll go as far as saying is unlike anything you’ve ever heard before. It’s nuts. In a recent interview with Noisey the band stated that the album, as the title suggests, is about the limitless possibilities we humans possess when we dream, and that concept has been translated perfectly in the sound through heavy usage of an insane amount of interesting bass/guitar effects and electronics. The album feels otherworldly from start to finish, like travelling through intense stages of a dreamscape, which is sometimes replaced with chilled out, psychedelic breathing rooms that sometimes sound like Pink Floyd. One of the beauties of this album is down to the fact that these mellow, laid back outings aren’t just forgettable interludes, but actually work as standalone tracks as well, by virtue of just having really interesting soundscapes. The post-rocky vibes heard on “Lira”, “Glitch in the You I Thought I Knew”, “Balboa” and “Harmonic Sleep Engine” are infectious with their lofty atmospheres and clean guitars smothered in delay and reverb effects, like finding solace in the wild journeys presented in the other absolutely mental songs. But where the album blows it out of the water comes in the stunning interplay between guitarist Nick DePirro, bassist Reilly Herrera and drummer Aric Improta. While the music is kind of show-off, meaning that there is a lot here that could be classified as wankery, a strong melodic presence and thoroughly unique use of delay, pitch shifting and other vibrant effects, combined with the groovy basslines and killer drumming capabilities, means that it is hard not to drop your jaw on the floor multiple times in awe. The intro to “No. 0” is a prime example of this; it catches you off-guard like being thrown into a wormhole, with blistering tapping riffs and double bass drumming, made all the more entertaining with pitch shifting and wah-pedal to make weird screeching noises. Another definite highlight comes in the next chapter of the “Phoenix” tracks that have been found on both ”Lift Your Existence” and ”Into The Vanishing Light”, which have been amazing, massive 10-minute tracks on each respective album. This one is no exception, going through various phases and moods, before culminating in a heavy, sludgy and altogether grandiose finale. It seems to be the culmination of all of the different aspects that have been heard on the album, combining them all into this one masterpiece of a track that would’ve been the perfect ending to a mesmerizing record. I am therefore not sure why the band opted to have “Infinity Beach” ending it all off, as it is a mellow, stoning, psychedelic rock track where the band’s Pink Floyd influence really shines through. Don’t get me wrong — it’s a great song. But not ending it all with the Big Bang that is “Phoenix IV: Levitation” just seems like a missed opportunity to me. Once more I have to give praise to Will Putney, who keeps impressing again and again. Yet again he shows his masterful production techniques that nail that right balance between a modern, punchy mix and still sounding like the music is played by humans. 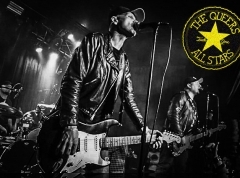 What is even more incredible is that the band has taken the steps necessary to ensure that this can be played live in full capacity — all these crazy sounds that are presented, absolutely everything you hear on the record, are played by the three-piece band. All the electronics and effects are triggered by hand and nothing has been added in post-production, which just makes the record even more impressive. And the anticipation of hopefully seeing these guys perform live sometime has gone through the roof and to the moon. I couldn’t have seen Night Verses execute a better transition to an instrumental outfit than this, and I would be surprised if this record didn’t end up on my list of top albums this year.